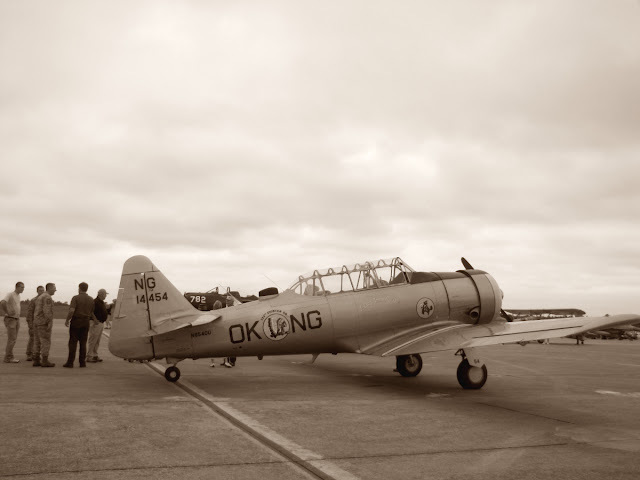 This is a North American T-6 "Texan" operated by the Oklahoma Air National Guard. It is nicknamed the "Tulsey Town Chief". Tulsey Town being a very old name for Tulsa. 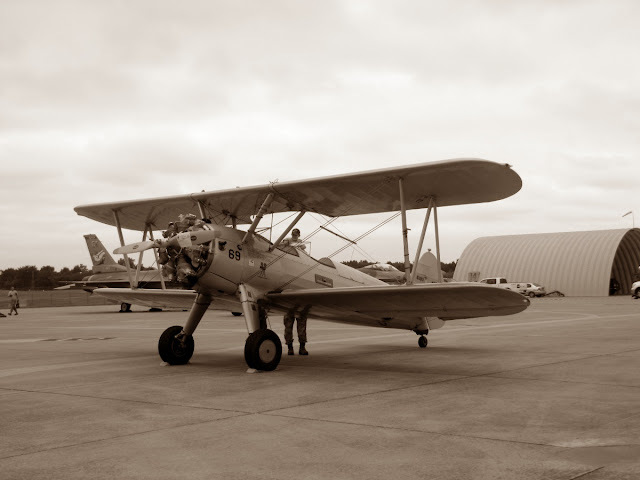 It was on display at the Air Guard's Family Day September 11, 2010. The North American Aviation T-6 Texan is a single-engine advanced trainer aircraft used to train pilots of the United States Army Air Forces, United States Navy, Royal Air Force and other air forces of the British Commonwealth during World War II and into the 1950s. 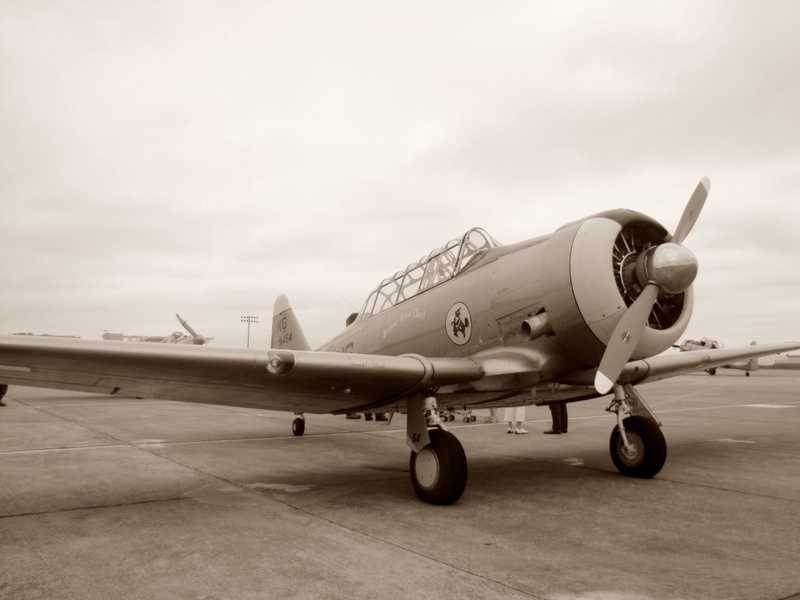 Designed by North American Aviation, The T-6 is known by a variety of designations depending on the model and operating air force. The USAAC designated it as the "AT-6", the US Navy the "SNJ", and British Commonwealth air forces, the Harvard, the name it is best known by outside of the United States. 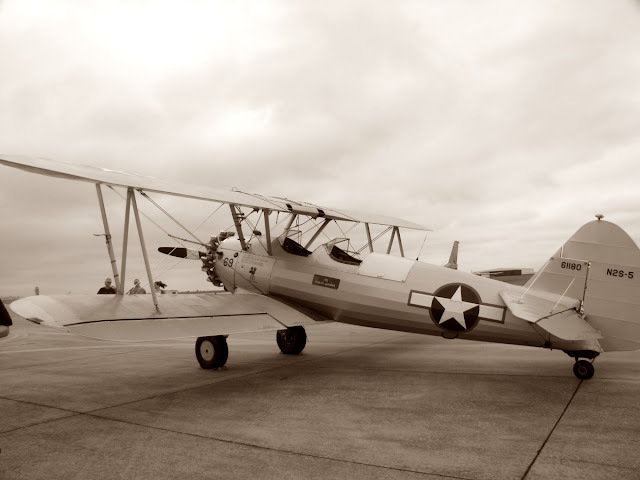 It remains a popular warbird aircraft. See Wikipedia. 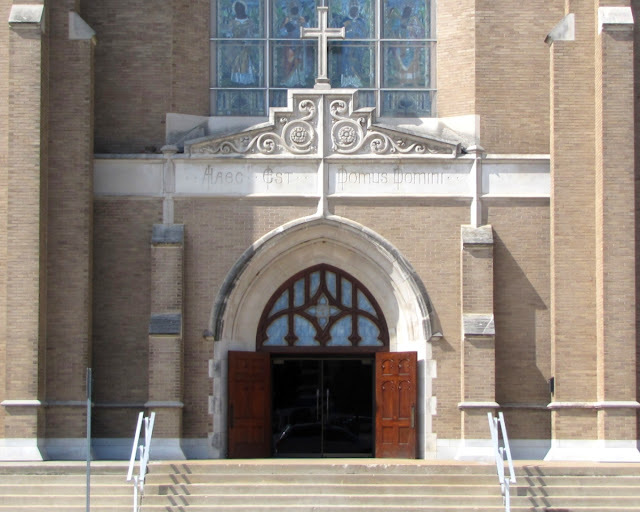 Front Doors to Holy Family Cathedral, downtown Tulsa, Oklahoma. Holy Family is the Cathedral Parish of the Roman Catholic Diocese of Tulsa. The parish has served the people of Tulsa since 1899. The current church was built in 1912-1919. 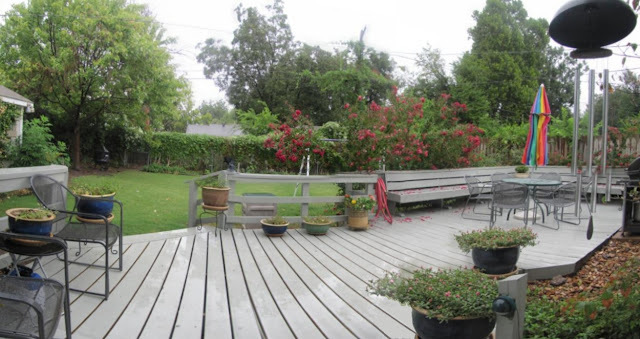 Now that we have extended our rear deck past the back door of the garden room it functions like another room, albeit an outdoor room. 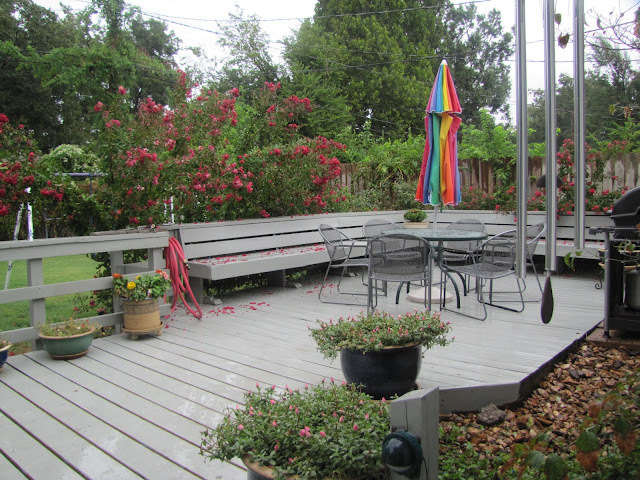 The old and new sections have been stained a matching gray and we have a new umbrella for the patio table. 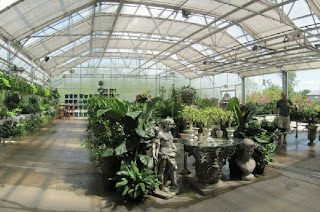 With the addition of some potted flowers it looks very nice. We like to eat breakfast out here and imagine that we are in a resort hotel on the French Riviera. 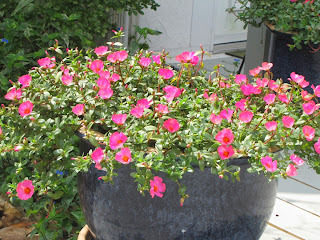 We have two big pots of moss rose that add a nice splash of color. 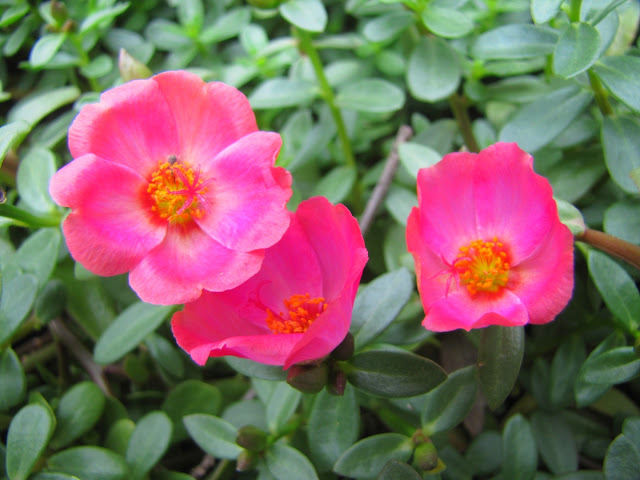 It is a deep rose rather than a bright red, but should be close enough for Ruby Tuesday. 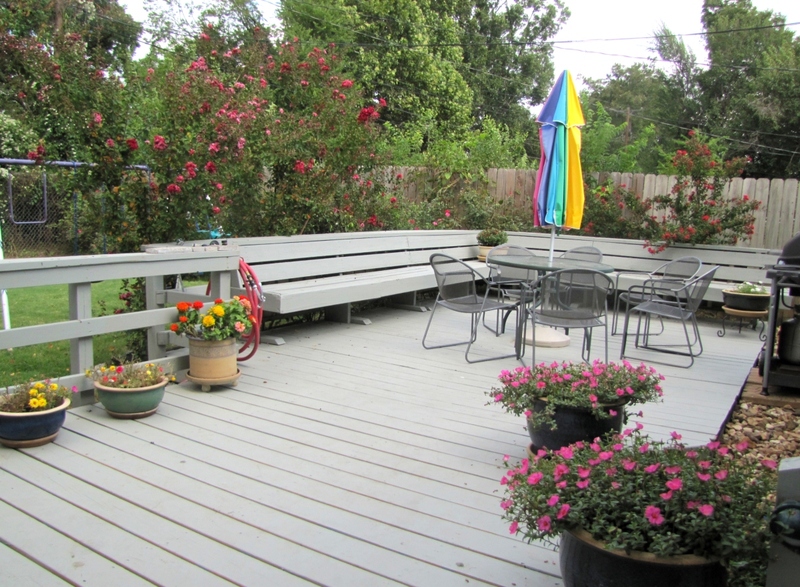 Stop by and join us for a cup of coffee on the deck. 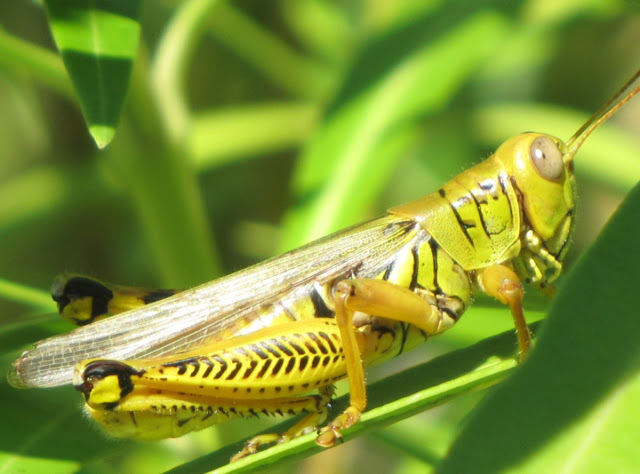 In some places this is a Locust but in Oklahoma it is a big green Grasshopper. 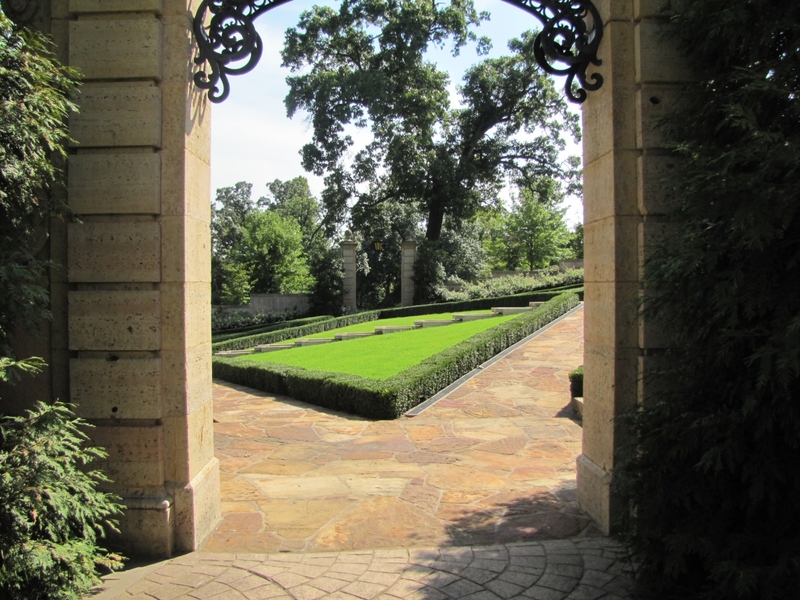 Yet another view of the Gardens behind Philbrook Art Museum, Tulsa. Koi at play in the Philbrook reflecting pond. 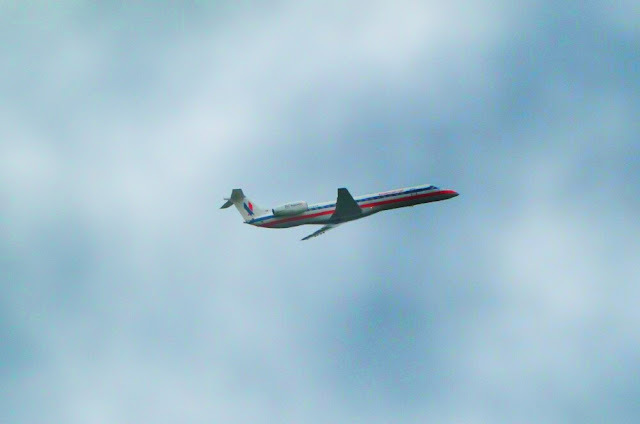 American Airlines Super 80 taking off from Tulsa International. 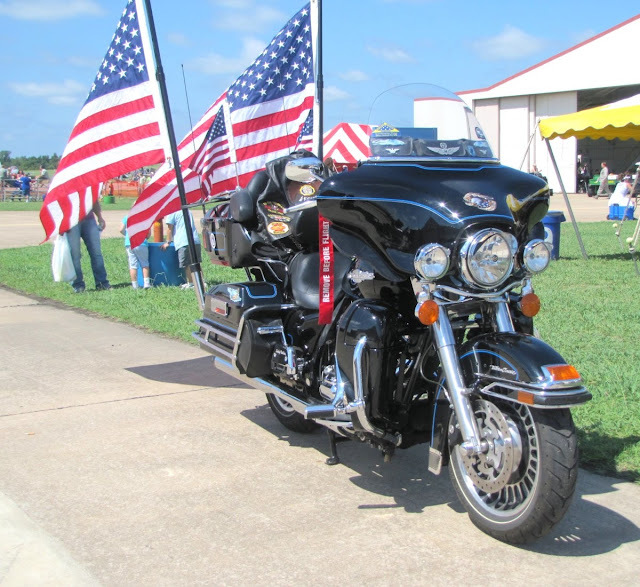 The All-American Harley Davidson motorcycle. Made in the USA and flying the red, white, and blue. 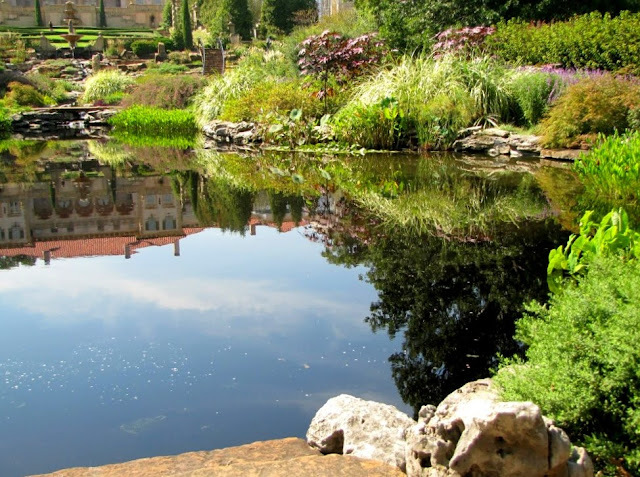 Another beautiful day at the Philbrook Gardens. My Friend David is 60. 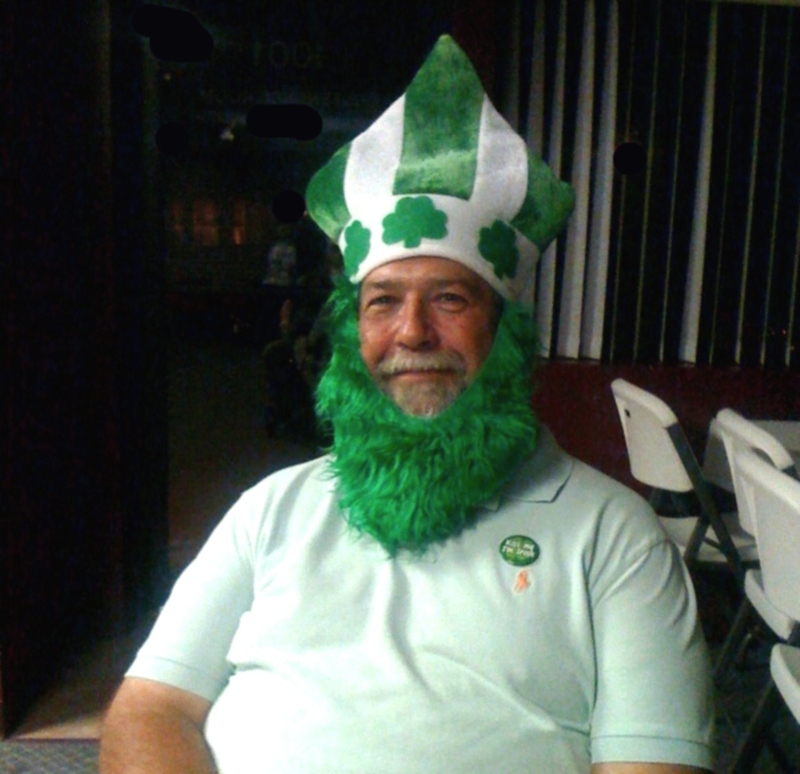 My old friend David is 60 today and like any good Irish Catholic celebrated the occasion with a party. There were refreshments and an Irish band. It was fun. Happy Birthday my friend. The newest venue on the Tulsa Skyline is the handsome BOK Center; the BOK being the Bank of Oklahoma of course. 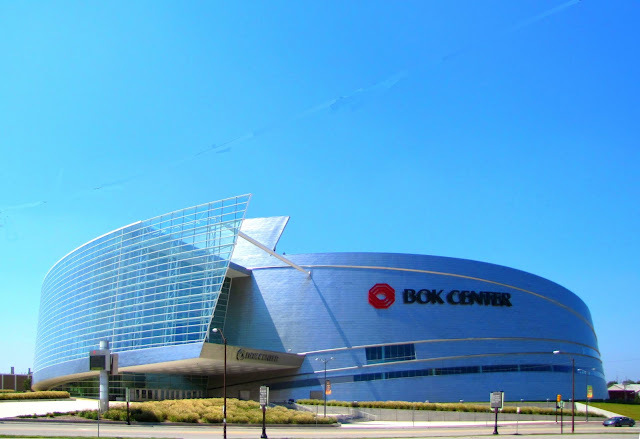 It is state of the art and can go from Rodeo arena to Ice Rink overnight. For an idea of size please note the automobile in the far lower right corner. It is very nice inside with 20,000 seats on 3 levels. The interior is completely open so there are no bad seats. Theme Thursday - Reveal: Album by R.E.M. 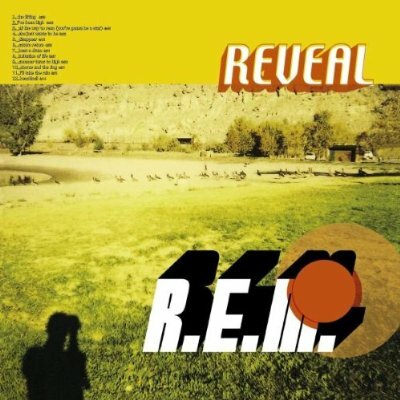 Reveal is a 2001 Album by the band R.E.M. Click here for a Youtube Video of "I've Been High" from the album REVEAL performed live by R.E.M. The Tulsa Union Depot was the grand railroad depot in downtown Tulsa. 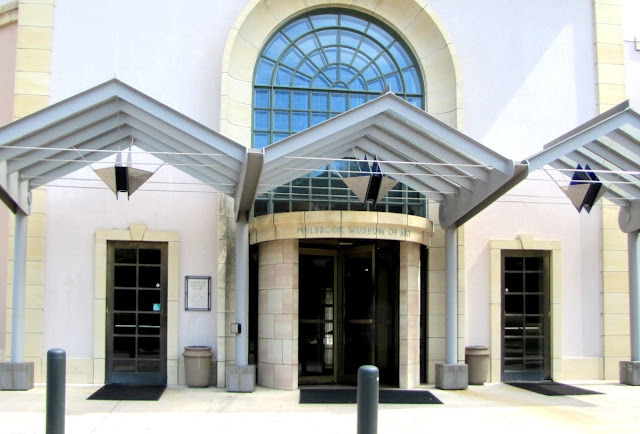 It is now the home of the Tulsa Symphony and a venue for a weekly Sunday night jazz performance. 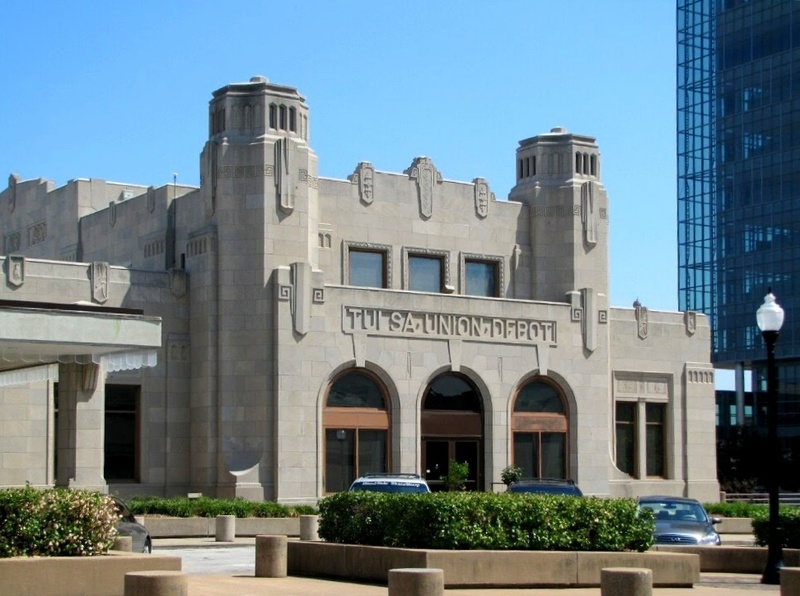 It is now known as The Tulsa Jazz Depot. Looking south on S. Boston Avenue. 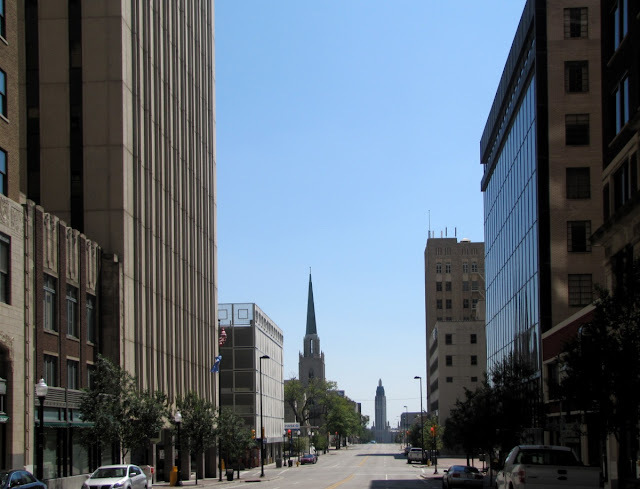 The spire in the distance is the Boston Avenue Methodist Church. Near Left is the old Frisco Railroad Terminal, upper left is the New Tulsa City Hall, reflected in the City Hall is the Mid-Continent Building, upper right is the Williams Tower. Since this is being posted on September 11, the anniversary of the infamous bombing of the World Trade Center bombing, an interesting thing to know about the Williams tower is that It was built in 1975 and designed by Minoru Yamasaki & Associates, the same architect who designed the World Trade Center in New York. This structure is very similar to the New York City WTC towers in appearance and construction. 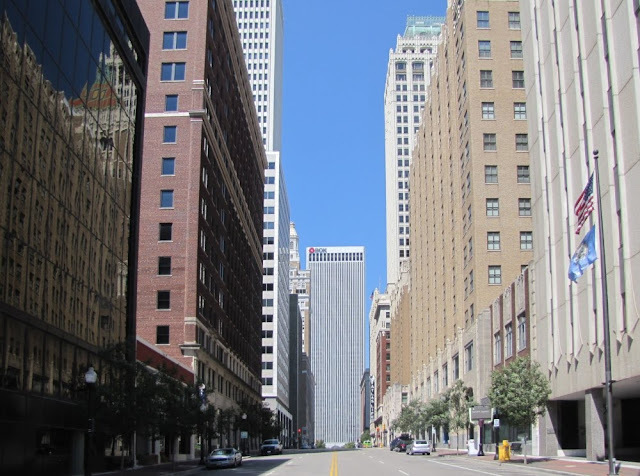 At 203 m (667 ft) in height, the 52-story tower is the tallest building in any of the five "Plains States": Oklahoma, Kansas, Nebraska, North Dakota, and South Dakota, as well as the surrounding states of Missouri, Arkansas and New Mexico. It is now called the BOK Tower. 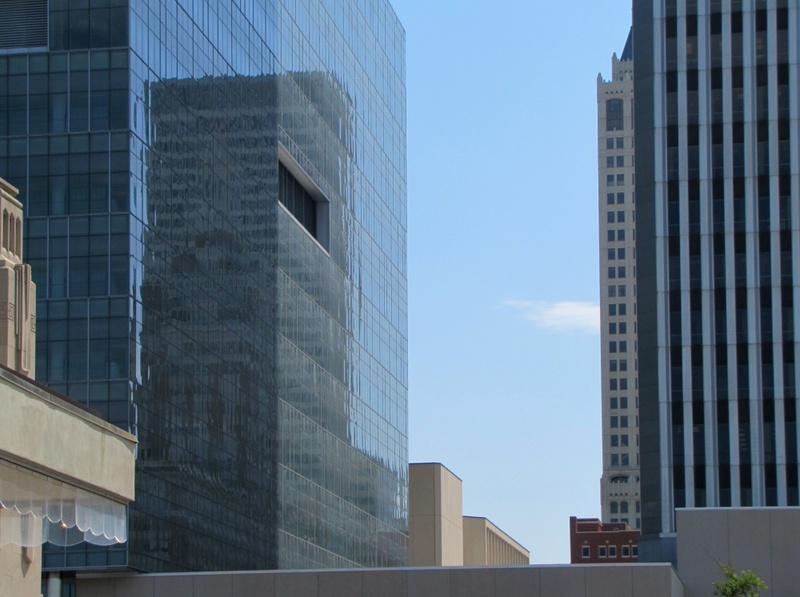 The 52 Story BOK Tower anchors the north end of South Boston Avenue . It started raining yesterday morning and it rained all day and all last night. I'm not complaining as we needed the rain. We have a little frog who sits bravely under his umbrella and measures the rain for us. 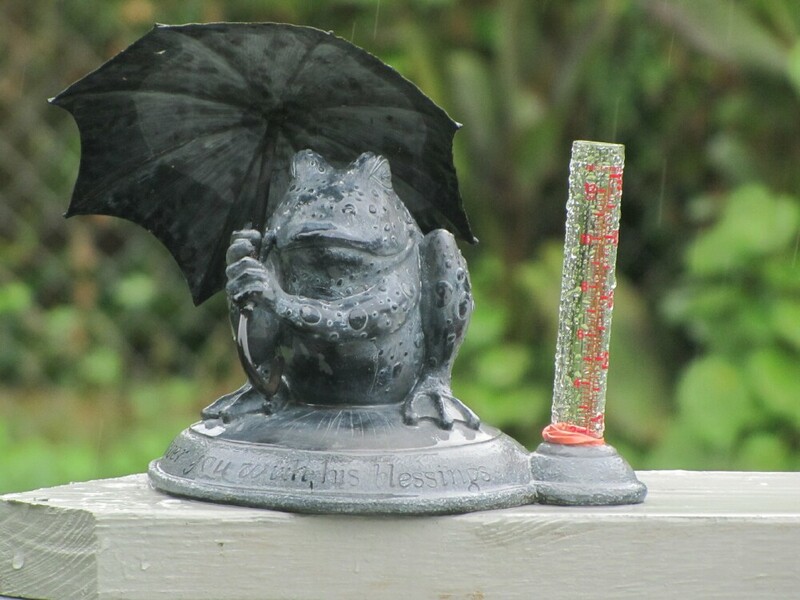 By noon today the rain had fizzled to a drizzle and the little rain gauge said about 8 cm or 3 inches. The nice thing was that it rained slowly and steadily so the water had time to settle in rather than all run off. It was a good rain. 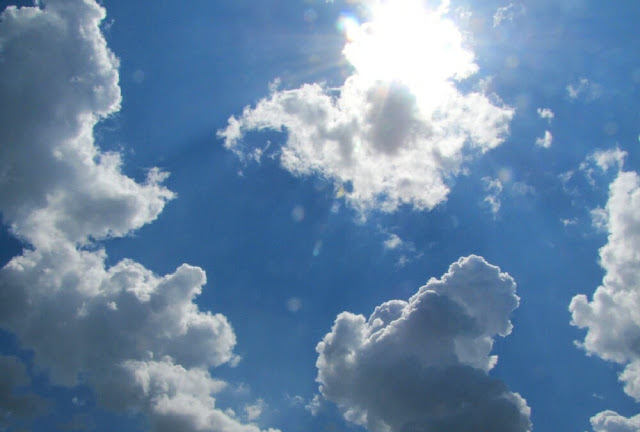 The sky? It was a solid gray and not very photogenic, but the rain that fell was very nice. 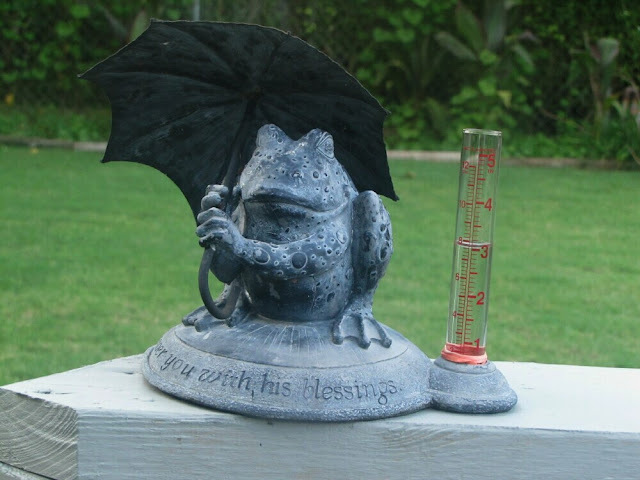 We have had a little rain off and on over the past week or so but today it got serious and has been raining all day. 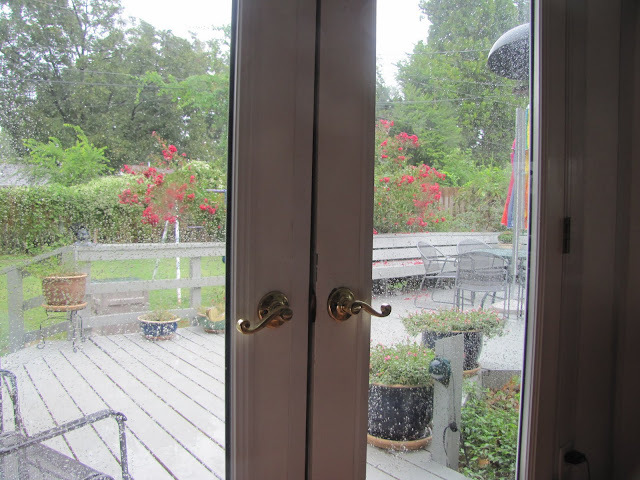 Looking out the back door onto our deck I decided no reasonable person would go out in the rain but it might make a nice picture. Opening the back door gave me a clear shot of the deck without getting wet. Just for fun I took multiple views covering the whole deck then used Autostitch to put them together. It did a nice job of showing the whole deck and I didn't get wet. Here is a bit of doggerel from long ago. that signals the beginning of Autumn. but the season has changed. and cookouts under the oak trees. These images, by photographers of the Farm Security Administration/Office of War Information, are some of the only color photographs taken of the effects of the Depression on America’s rural and small town populations. The photographs are the property of the Library of Congress and were included in a 2006 exhibit Bound for Glory: America in Color. Link courtesy of The Denver Post. America in Color from 1939-1943. This doorway to a little candle shop at 29th and South Harvard is framed by an arbor of Yellow Trumpet Vines. 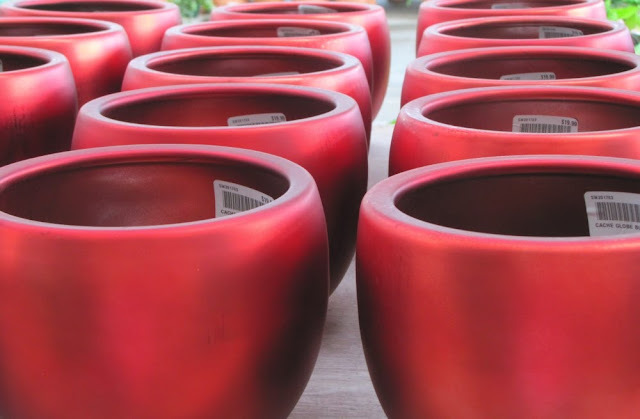 Some wonderful red pots from Southwood Nursery. I do the percussion for my church's music group. Normally I use a big Djembe drum for a variety of sounds but have some other things as well. 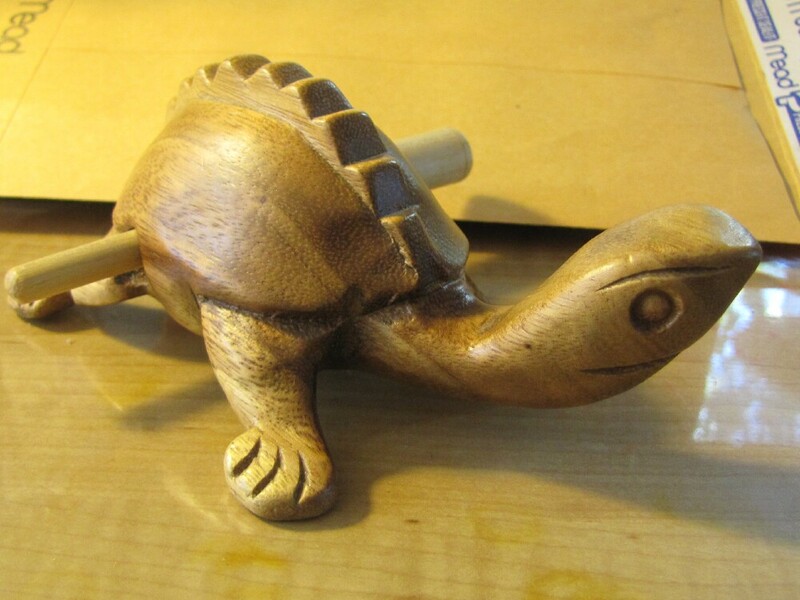 This little guy is a Guiro (pronounced WEE-roh) carved in the shape of a turtle. The wooden rod or striker is used to run back and forth over the ridges along the back of the shell, or strike the body which is hollow. It makes a nice bright cheerful sound. Sam. the 2 year old son of our cellist (cello player) was playing it today. We took Smokey to the veterinarian on Friday to have his teeth cleaned. It seems that 3 were bad and had to be pulled. 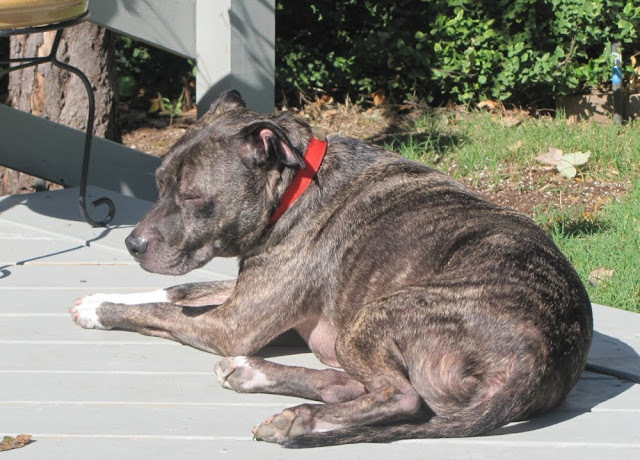 Poor Smokey was recuperating in the sun this morning. If only we could get him to brush. 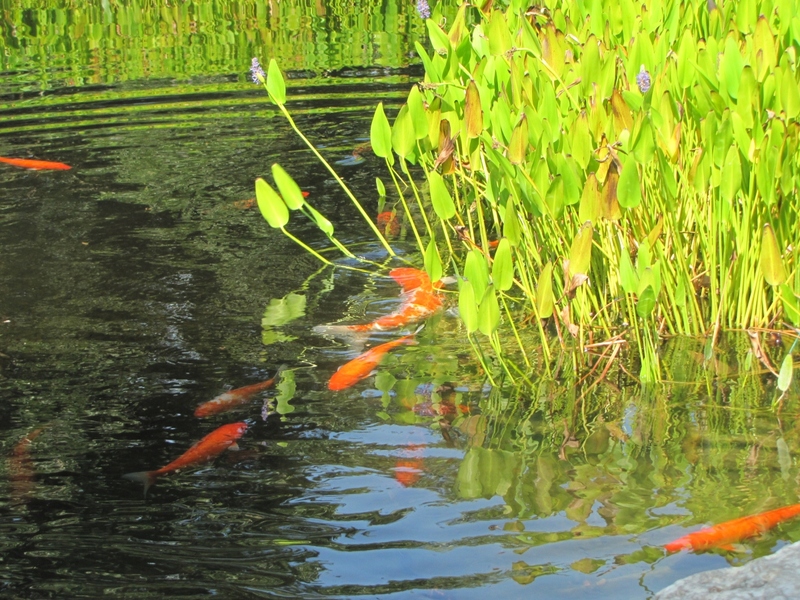 Just south of our church is a nice housing addition with two large ponds astride the entrance. 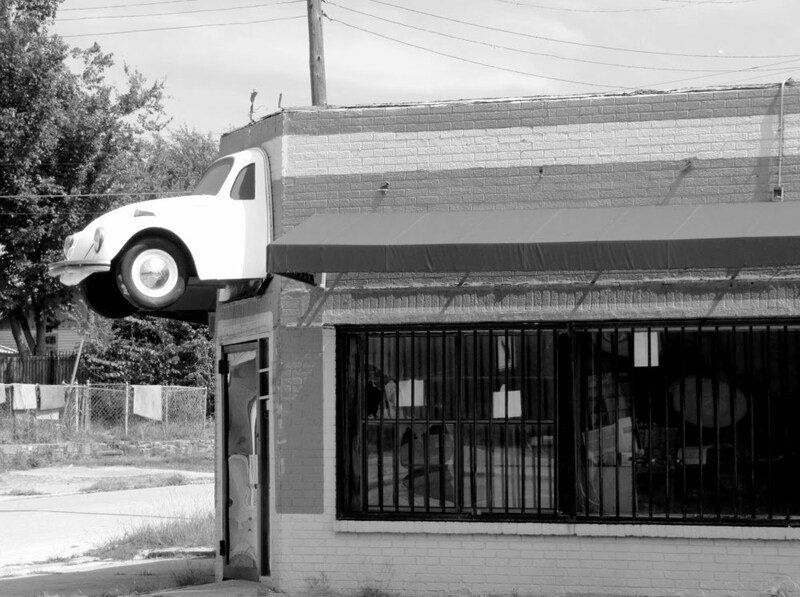 Last Sunday I drove just inside to take a closer look and took several photos. With the stonework around the entrance it is quite lovely. 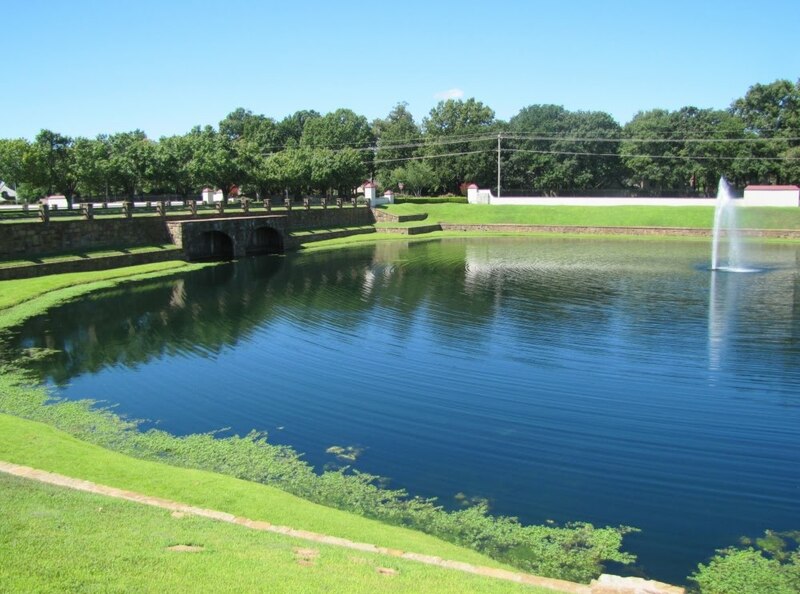 For those who asked about the source of the ripples, here is the original in color and the fountain . 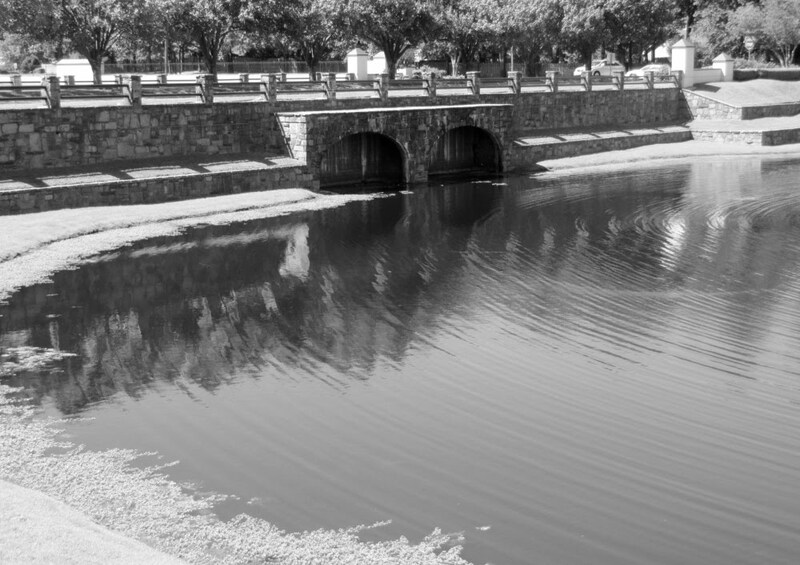 It might have been better in color, but a little mystery is fun. Click for a YouTube video. 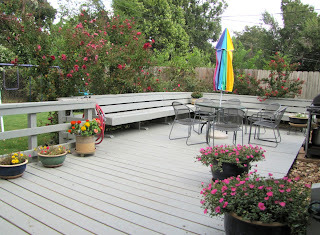 The weather has cooled down and we had breakfast on the deck. 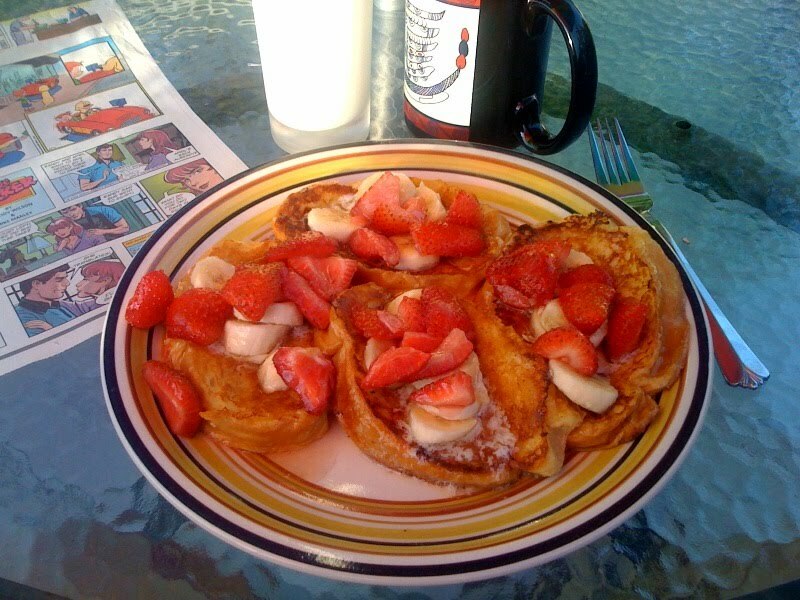 Slices of good bread dipped in egg, sauted in butter and topped with fresh strawberries and slices of banana. Our extreme heat seems to have broken. We are ready for some fall weather. 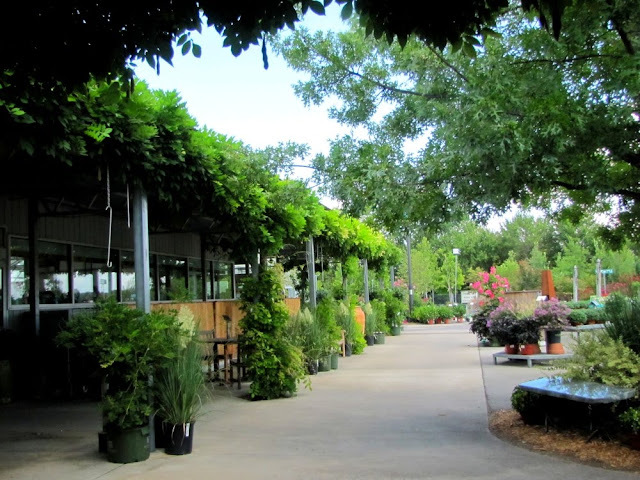 Tulsa has a number of open air markets where plants and gardening supplies are sold. My favorite is Southwood Landscape and Nursery at 91st Street and South Lewis in Tulsa. 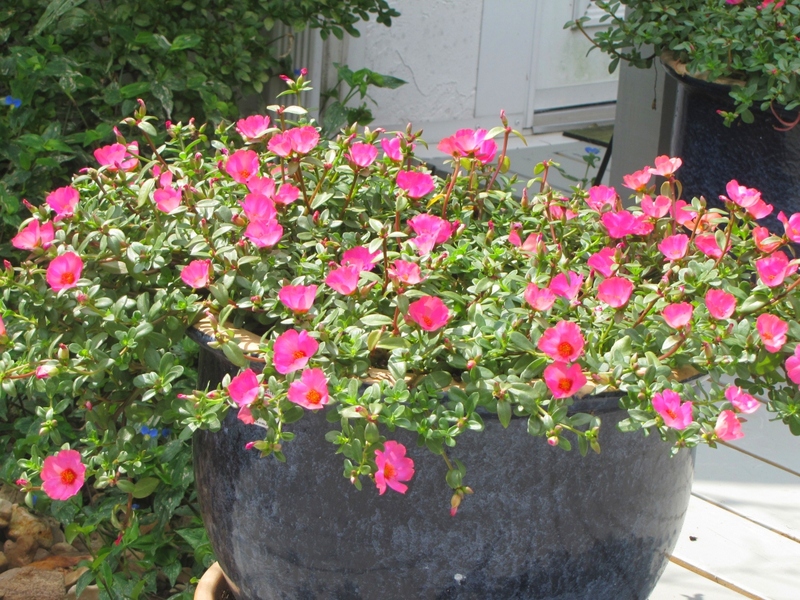 They have everything from small bedding plants to established trees in tubs ready to be transplanted in your garden. 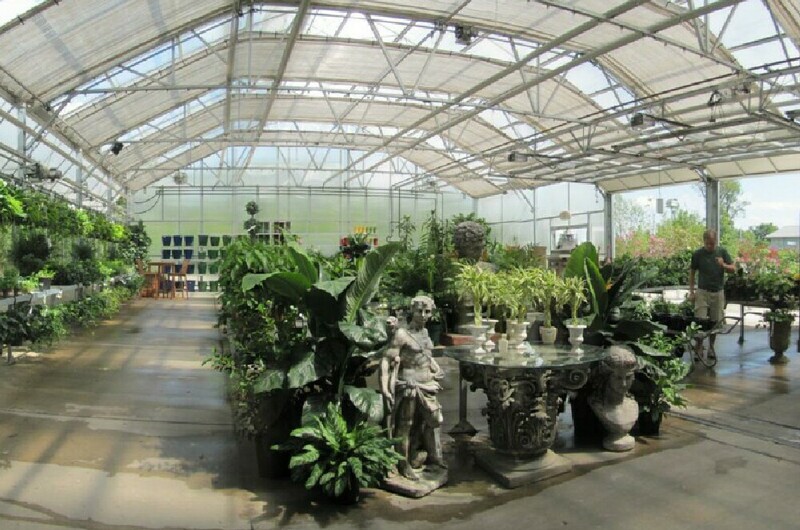 The nice thing about Southwood is that the helpful staff includes some knowledgable horticulturists who can give advice on appropriate varieties and how and when to plant. 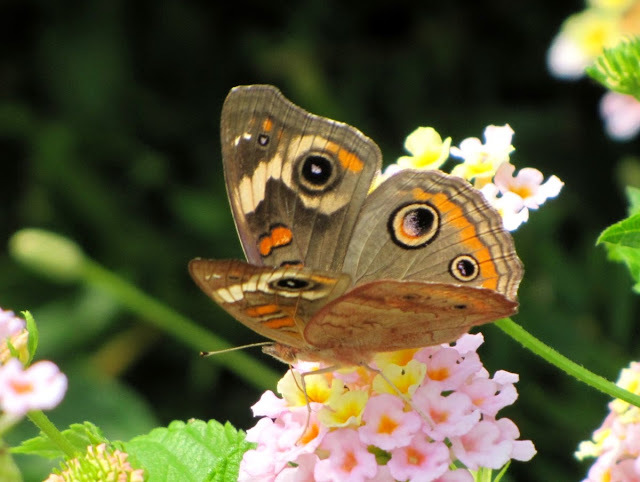 In the past I have bought bargain trees and shrubs from parking lot nurseries and after planting them myself watched them struggle through a season or two and then expire in the August heat. No doubt this works for some but my results have been mixed at best. 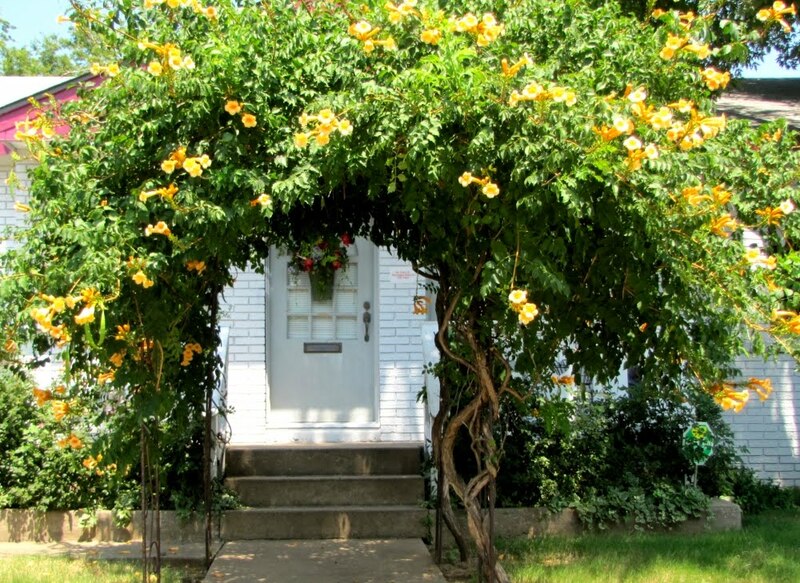 I know that the two Red Maples I bought from Southwood and had them come out and plant them for me are 30 feet tall and looking better every year. You get what you pay for. 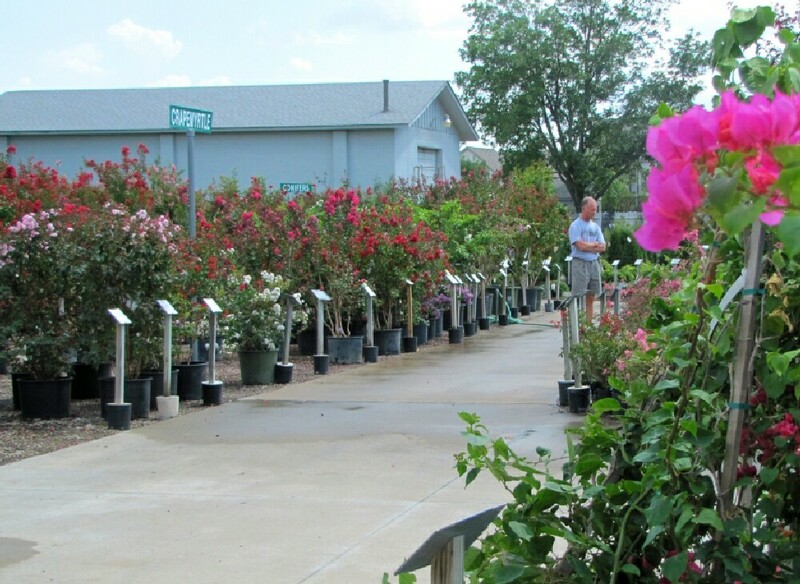 They have a large selection of trees, shrubs, and flowering plants from azaleas to zinnias!! Best of all they are nice people who go out of their way to be helpful. The first day of each month there is a theme for all City Daily Photo Blogs. Tulsa Gentleman is a City Daily Photo Blog for Tulsa, Oklahoma. The theme for September is "Open Air Market".